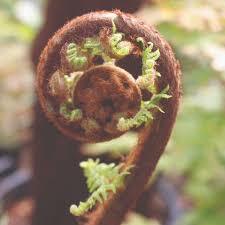 In our covered Sales tunnel we have a collection of beautiful hardy tree ferns – Dicksonia antarctica. Some of the trunks are seven feet high with the graceful arching fronds towering above - which since the trunk’s average growth is only one inch a year makes them around 100 years old. Throughout the year the new growth of furry croziers uncurl into fronds from the crown of the trunk at an astonishing speed until in a matter of days they are fully unfurled and form a lacy light green canopy. This ancient species (fossil records show these ferns date back to the Jurassic period – before flowering plants evolved) was named for James Dickson (1738-1822) a Scottish nurseryman and botanist, although he did not discover or collect any tree ferns; neither indeed do they come from antarctica as they are native to the damp, sheltered woodland slopes and cool temperate rainforests of eastern Australia and Tasmania (where their trunks are hosts for a range of epiphytic plants such as other ferns and mosses). The tree ferns arrived in this country in the nineteenth century in the guise of logs as ballast in cargo ships from Australia which was then discarded on the quayside when the ships were unloaded. In the mild and damp climate of south west England (and also in the west of Ireland and Scotland warmed by the Gulf Stream) these “logs” unfurled their fronds and the interest in tree ferns began. Although Dicksonia antarctica is evergreen and is the hardiest of the tree ferns it needs a sheltered, moderately shady location protected from strong winds to look its best – which is magnificent.